Join the Southern Federal Tax Institute mailing list. 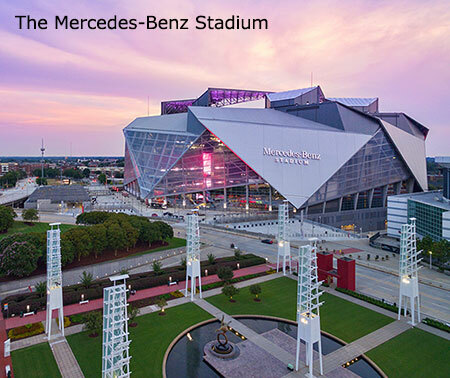 Head downtown for a tour of the amazing new Mercedes-Benz Stadium, opened in August 2017 and home to the 2019 Super Bowl. Or visit the Center for Civil and Human Rights, the College Football Hall of Fame and Fan Experience, Georgia Aquarium, World of Coca-Cola, Inside CNN Studio Tour, or the SkyView Ferris Wheel. Advance online tickets are recommended for all attractions. If you fancy yourself a "foodie," don't miss the incredible Food Hall and shopping at Ponce City Market. Venture to the roof-top deck where Skyline Park offers old-school carnival-style games and miniature golf overlooking Atlanta's Midtown skyline. Catch a puppet performance of Dr. Seuss's The Cat in the Hat at the Center For Puppetry Arts. The newly expanded museum features the world's most comprehensive collection of the work of Jim Henson. Visit www.puppetry.org for details and tickets. Just down the street from the Grand Hyatt, you'll find some of Atlanta's best shopping at Phipps Plaza and Lenox Square Mall. Or venture a few blocks away to the Shops of Buckhead Atlanta.